As educators, we know that everyone in the school building is a learner. Therefore, let’s learn Applied Digital Skills alongside our students. That’s right! Today is your turn to learn. By experiencing the curriculum from the perspective of a student, you’ll be better prepared to use it in your classroom. Now, who’s ready for a challenge? 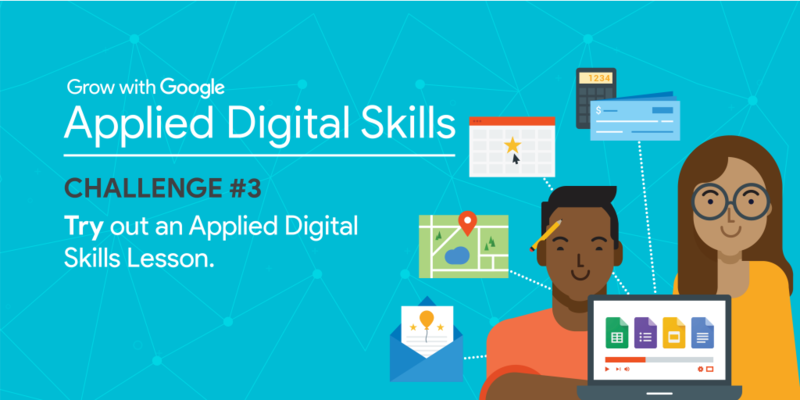 In the spirit of lifelong learning, today’s challenge asks you to watch one of the Applied Digital Skills videos and learn something new yourself! To enter today’s challenge, take a screenshot, photo and/or selfie of what you learned and share it on Twitter, Facebook or Instagram with #GrowWithGoogle and #EdTechTeam. What else might students learn? As you can see from being an Applied Digital Skills learner yourself, the curriculum consists of self-paced video lessons. Students watch a series of videos and then use various Google Apps to complete a practical, skill-building project. Let’s look at a few more examples of what students (and educators!) can learn. Students brainstorm and collaboratively write a choose your own adventure story. Then they use Google Slides to create a branching, hyperlinked story. I really like these types of activities because they combine planning, logic, and creativity. 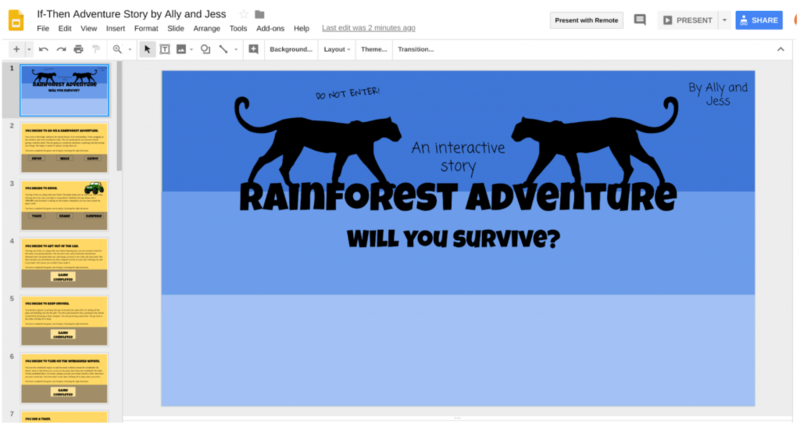 Example from the classroom: Rainforest Adventure! Students choose a topic to research and then communicate their findings. In this example, students used Google Docs to organize and share their learning. Tomorrow, we’ll further explore the Applied Digital Skills curriculum so you can find the perfect unit to build the skills your students need! Thank you for learning something new with us today! I invite you to join me this evening, Wednesday, October 10 @ 4:00 PM PST / 7:00 PM EST, for a panel discussion. I’ll be talking with a Googler from the Applied Digital Skills team along with teachers who are implementing and remixing Applied Digital Skills in their own classroom! After we wrap, I’ll be giving away some fun prizes for those who join us live. Hope to see you there! Sign up and save your spot. See you tomorrow for the Applied Digital Skills Week Day #4 Challenge! LOOKING FOR MORE TIPS TO BRING APPLIED DIGITAL SKILLS TO YOUR CLASSROOM? Sign up for a free email-course featuring tips for integrating these lessons into your subject area.